Matching tumor patients to the right medication has been an unprecedented dilemma. Tumor mutational burden (TMB) is a biomarker that measures the number of mutations present in a cancer patient’s tumors. The number of somatic mutations within all coding regions is detected and quantified as mutations per megabase (mut/MB). This metric can be used to classify tumors into classes with low, medium, and high mutational burdens. Long-term studies of therapy success can now be performed. They show that treatment decisions should take TMB into account to provide maximum efficacy for every patient. TMB is typically assessed by whole-exome sequencing. Alternatively, sequencing a reduced set of relevant genes with a higher sensitivity can be sequenced to raise the TMB. Therefore, the targeted tumor gene panel can help accelerate clinical trials by identifying responders to a range of targeted therapies and immunotherapies. As patients with high microsatellite instability (MSI) have a much greater response to checkpoint inhibitors, CeGaT offers solutions to estimate TMB and to determine evidence for MSI en masse. MSI is caused by failure of the DNA mismatch repair system. High levels of MSI correlate to an increased neoantigen burden. Traditionally, MSI is detected through comparison of satellite regions in tumor and normal tissue. However, CeGaT can determine MSI status via NGS which was validated with 458 normal tumor sample pairs across six cancer subtypes, testing more than 2,500 target microsatellite loci. The distribution of mutational load (somatic variants per megabase of coding DNA) is shown for 27 different tumor entities (n=3083). 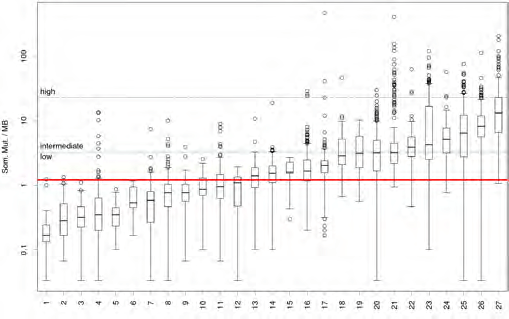 Boxplots show the range containing 50 % of all values (interquartile range, IQR, between percentile 75 and 25) as boxes, medians as solid horizontal lines. Outliers (circles) are shown for values deviating by more than 1.5 times the IQR (indicated by vertical lines). The mutational load of %mutational-load-value% mut/Mbp determined for the current case is shown for comparison (solid red line). Y-axis is log scaled. The classification into low (23.1 mut/Mbp) mutational loads as described by Johnson et al. (2016, PMID: 27671167) is indicated with dashed lines. Entities are: (1) Rhabdoid tumor, (2) Ewing Sarcoma, (3) Thyroid cancer, (4) Acute myeloid leukemia, (5) Medulloblastoma, (6) Carcinoid, (7) Neuroblastoma, (8) Prostate cancer, (9) Chronic lymphocytic leukemia, (10) Low-grade glioma, (11) Breast cancer, (12) Pancreatic cancer, (13) Multiple myeloma, (14) Kidney clear cell, (15) Kidney papillary cell, (16) Ovarian cancer, (17) Glioblastoma multiforme, (18) Cervical cancer, (19) Diffuse large B-cell lymphoma, (20) Head and neck carcinoma, (21) Colorectal cancer, (22) Esophageal adenocarcinoma, (23) Gastric cancer, (24) Bladder carcinoma, (25) Lung adenocarcinoma, (26) Lung squamous cell carcinoma, (27) Melanoma (Figure modified referring to Lawrence et al., 2013, PMID: 23770567).